One of the favorite designs in this category, this shirt is a wonderful gift idea for Israel lovers. 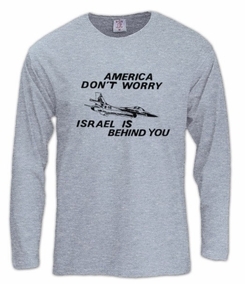 "America Don't Worry, Israel Is behind You" is printed on the front with the famous F-16 flying in the middle. Our t-shirts are made of 100% cotton and are long lasting with bright colors. Our products are all designed and printed in Israel.